It’s Wednesday, and that means new comics. Let Deadshirt steer your wallet in the right direction with reviews (and preview pages) of titles out today from Image, Dark Horse, IDW, BOOM! 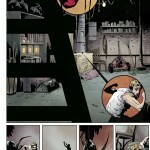 Studios, Archie, MonkeyBrain, Oni, Fantagraphics, Top Shelf, Action Lab, and more! After last issue’s cliffhanger, it’s almost impossible not to hear the perky voiceover from the 1980s cartoon series when I opened this issue: “And now, back to Jem!” The Misfits’ favorite hanger-on, Clash, has sabotaged Jem and the Holograms’ first major performance, nearly killing Jem and injuring her bandmate Aja. If that wasn’t enough to worry about, Jerrica begins to realize the dangers of keeping a dual identity when her relationship with Rio hits a snag. With tensions mounting, what will happen when the Holograms and the Misfits finally meet face-to-face? 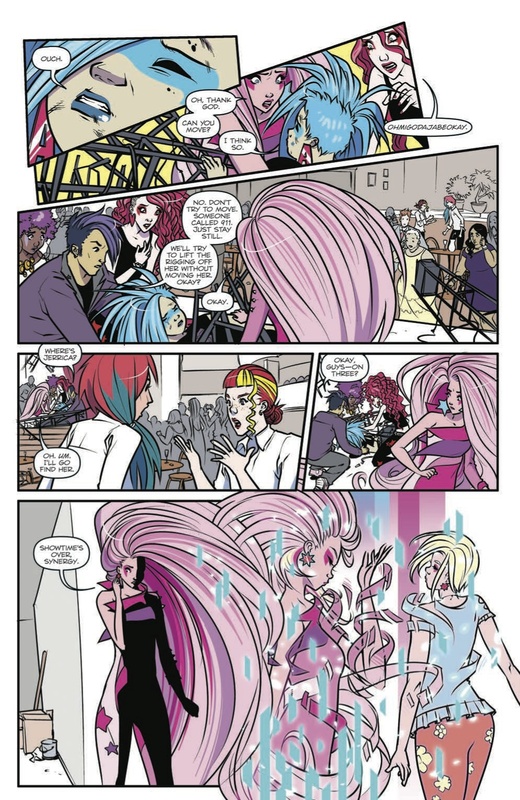 Kelly Thompson and Sophie Campbell’s Jem and the Holograms is an incredibly fun book. Thompson’s writing is bubbly and charming, and she gives a much needed 21st century makeover to some of the original show’s more baffling aspects. Her biggest accomplishment is making Rio an actually likeable, believable character. Instead of two-timing (or is it one-timing?) Jerrica with her secret identity, Jem, Rio is fully smitten with Jerrica but, misunderstanding Jem’s mysterious comings and goings, thinks she’s a major diva. It’s not easy to juggle such an enormously colorful cast, but Thompson manages it well—the possible exception being Jerrica. Despite being the title character, Jerrica’s shy, modest personality runs the risk of fading into the background, especially when the Misfits are up to their obnoxious antics. Regarding Sophie Campbell’s art, I realize I have to write actual comments here, instead of just making “homina homina homina AWOOGAAA! !” cartoon wolf noises. Sophie Campbell’s eye for fashion and character design is fantastic, and I’m continually amazed at the sheer variety of gorgeous, stunning, and just plain cute (Pizzazz’s skull pajamas!) clothing and hairstyles on display in every issue. 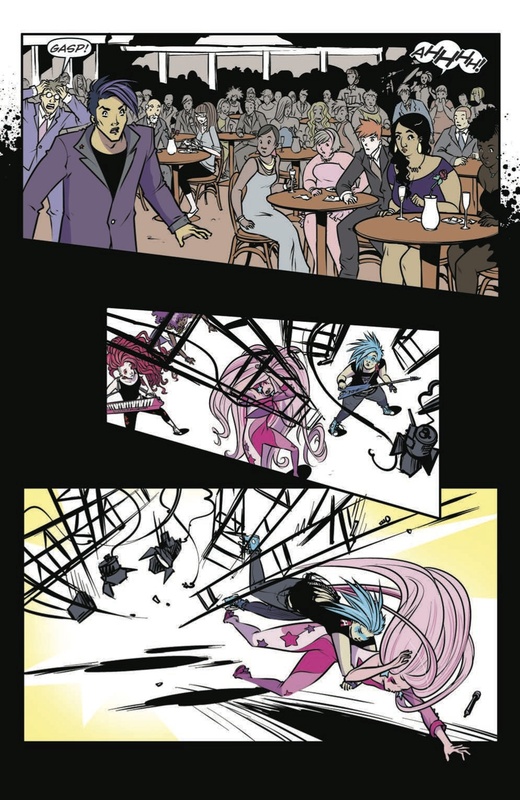 Artistically, Jem and the Holograms is one of the most vital and striking comics on the stands right now. 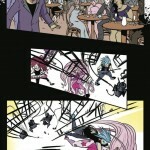 The penultimate issue of Jem’s first story arc is a neon pink delight. The first few pages of this issue seem like Roberts and Milne are trying to beat Transformers vs. G.I. Joe in the weirdness sweepstakes…and winning handily. There’s not a robot to be seen, the characters are seemingly inhabiting human bodies on the set of Friends, and the planet has a laugh track. They even find a creative use for the advertisement pages by using “stock footage” from previous issues as a “title sequence.” This issue is a love letter to sitcoms and I’m probably only getting half the references. Roberts has been accused of being self-indulgent before, and this issue won’t change those opinions. Regardless, his skills and his passion for the characters are on full display. 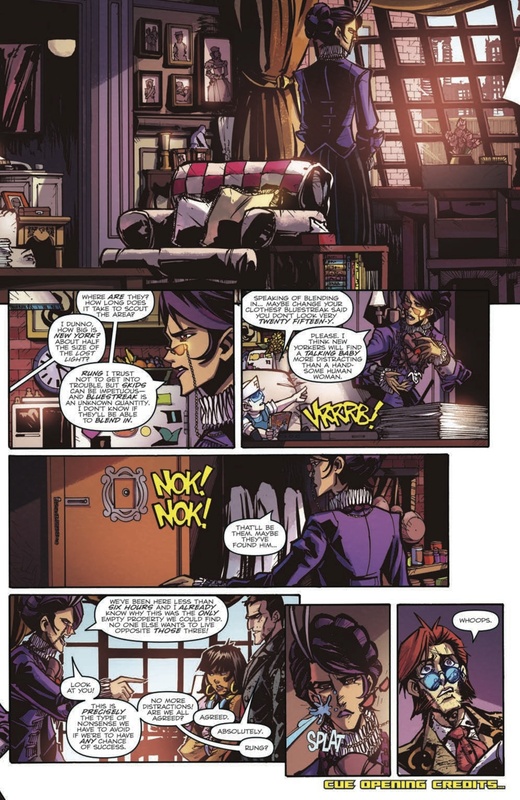 The premise of the issue—that fan-favorite bartender Swerve has had a breakdown, and to save him the Lost Light crew must assume their “holomatter” human forms and follow him into a simulated Earth—is actually explained wholly with technology that has been introduced by Roberts and previous authors. Whatever else Roberts is, he’s a master of planting and payoff, and I can think of dozens of individual story elements in previous issues that are knitted together here. 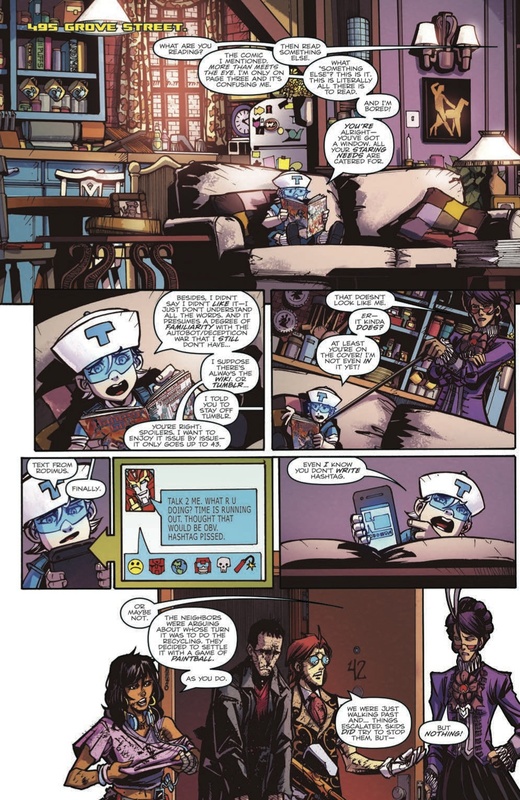 For instance, Swerve’s obsession with Earth-style sitcoms was set up something like thirteen issues ago when he downloaded all of our digital media into his head, and brought up several times since. Even the ship’s resident Earth culture expert/hipster Bluestreak is pretty flummoxed by the situation. This isn’t a Star Trek style “holodeck” episode, where everyone decides to horse around in a shared scenario until the third-act twist. This story would have overstayed its welcome in a two-parter, so I’m happy to report that it wraps up nicely, though with a nice hook (and by nice I mean pointy, jagged, and scary) for future, less surreal material. If you’re the type who likes their toy-based robots funny and weird, you should enjoy this issue. A highlight as always are the “human holo-avatars” designed by Milne. 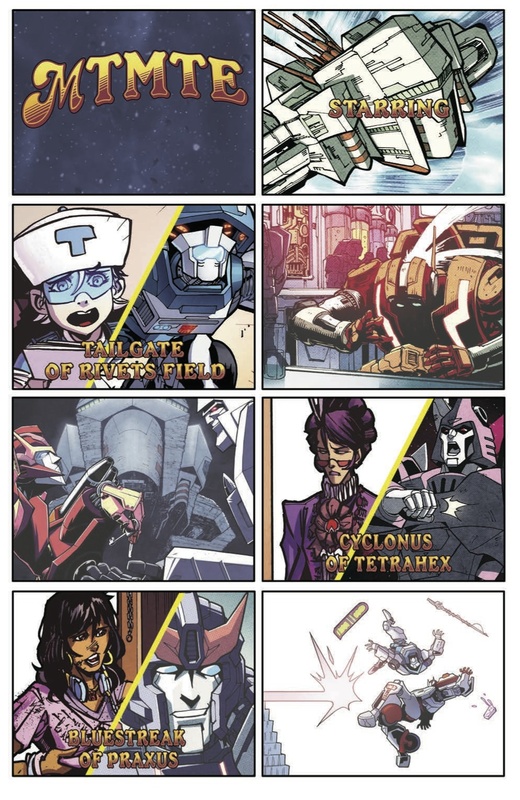 These are designed to reflect the personalities of their Transformer characters (though not necessarily their gender), and new ones introduced this issue include Bluestreak, Cyclonus, and Megatron. Even if you have only a vague familiarity with this book and its premise, if you like sitcoms this might be a good issue to pick up as a one-shot. 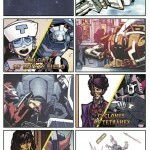 If you hate sitcoms but you love MtMtE, there should still be plenty here to hold you over. 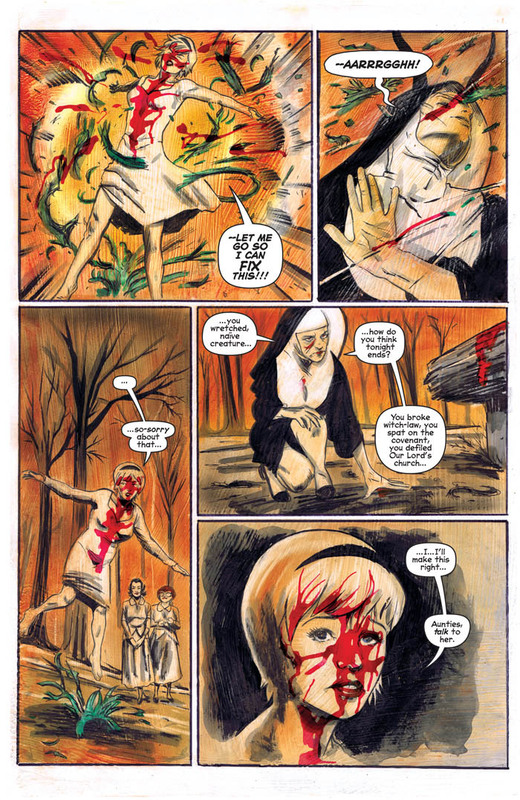 This dark and grotesque reimagining becomes intensely moreso as Sabrina’s well-meaning boyfriend, Harvey Kinkle, interrupts her becoming a bonafide witch in a creepy satanic ritual. This issue seems thus far the most ripe with nostalgia but also the most horrific and depressing, making for an interesting amalgam of innocent childhood comics and a solid addition to the horror genre. There’s even a narrator speaking directly to the reader, this time beckoning them to pray for poor Harvey as he’s chased through the woods by a succubus, in the same way Vincent Price would speak to the audience in an old horror flick. Robert Hack’s artwork continues to be a stunning highlight that blends a vintage aesthetic with contemporary violence and terror. His haunting illustrations are brought to life with a heavily sepia palette that tones down every color except, of course, for bright red. 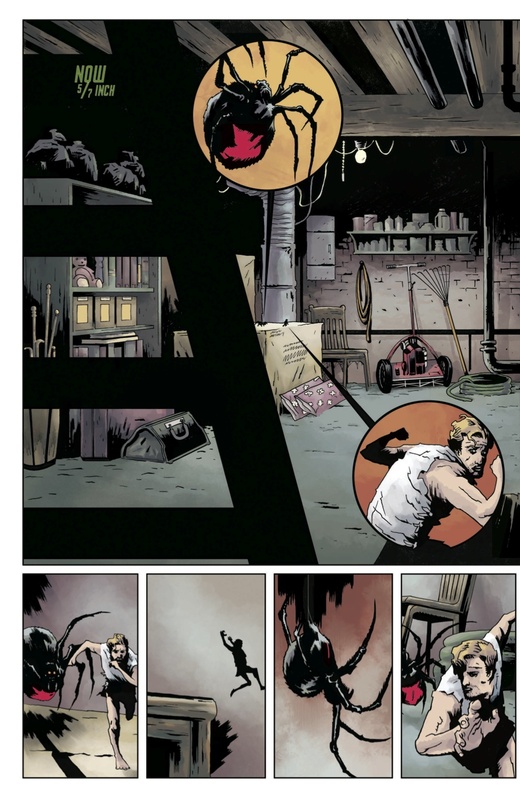 I noticed in this issue that he managed to incorporate the striking crimson color onto every single page, ranging from common (Sabrina’s lipstick, an aunt’s sweater, a stop sign) to carrion (blood, so much blood), like a flashing red reminder that something awful is bound to happen the second you turn the page. 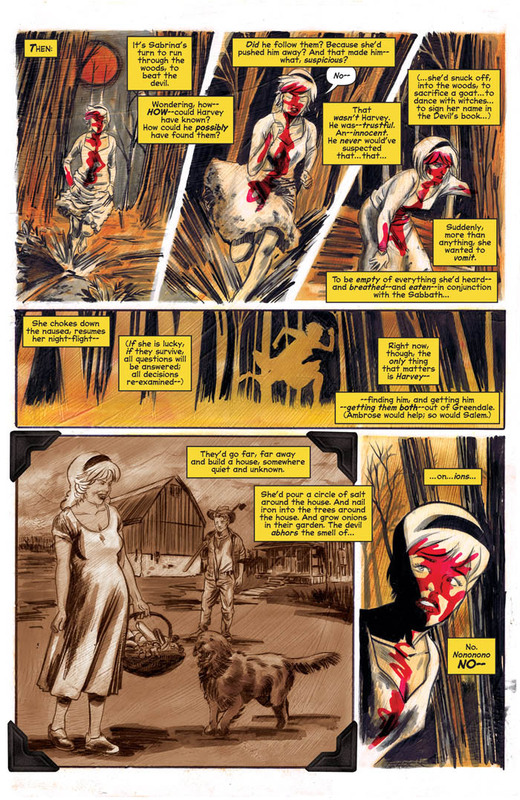 Despite the fact that a jaunty, classic issue of Sabrina acts as a bookend, making for a kind of hilariously jarring change in mood for this comic (which literally ends with the word “Necromantic”), the story finally seems to be pulling away from the reboot schtick and is settling into its own worldbuilding. Sometimes you need some “WTF” escapism, and these new adventures of Sabrina are truly chilling. It’s sort of funny timing, this coming out with Ant-Man in theaters. 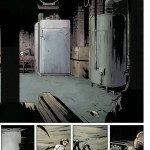 In IDW’s adaptation of Richard Matheson’s novel, the lead, Scott, doesn’t have a superheroic ability to change size. Instead, a chemical accident has him slowly, inexorably losing 1/7th of an inch per day, without any hope for a cure or treatment. 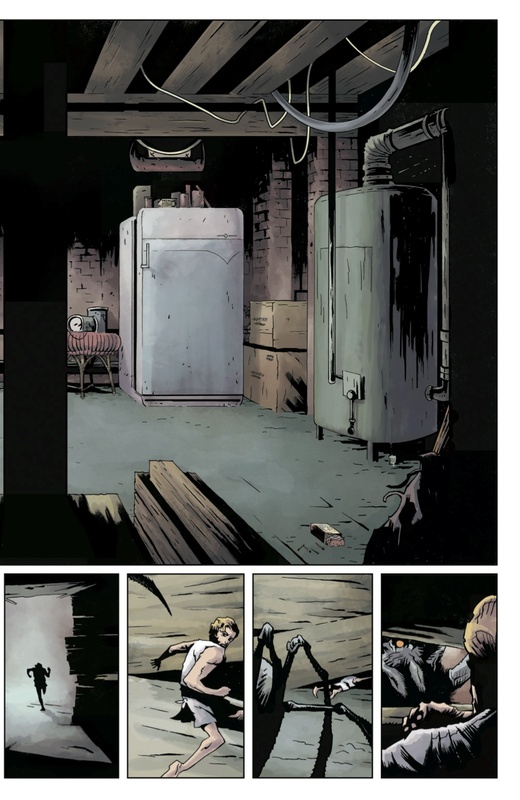 The story flashes between the early days of his condition, when his change puts stress on his relationship with his wife, and the present, where he attempts to scale a refrigerator for food and fights off a black widow spider. As a fan of the novel, it’s interesting to see the creators’ take on the story, and what does and doesn’t translate into comic form. Adams and Torres keep the major elements and themes of the story, and Scott’s feelings of emasculation and isolation are captured well. His rumpled, oversized clothes hanging from his child-sized form as he attempts to be intimate with his wife are an especially vivid in detail. But the protagonist seems softened here, and although we’re only in the beginning of the story, he’s not quite as despicable or Kafkaesque as I remember. It’ll be interesting to see if that’s only a preliminary thing, or if the story is (unlikely as this sounds) a bit sanitized for new readers. Still, it’s a solid execution of a clear, bleak premise. Torres strikes a nice balance of muted motion for the more play-like conversation and high-stakes action later on, and Varga’s palette is clear and readable. 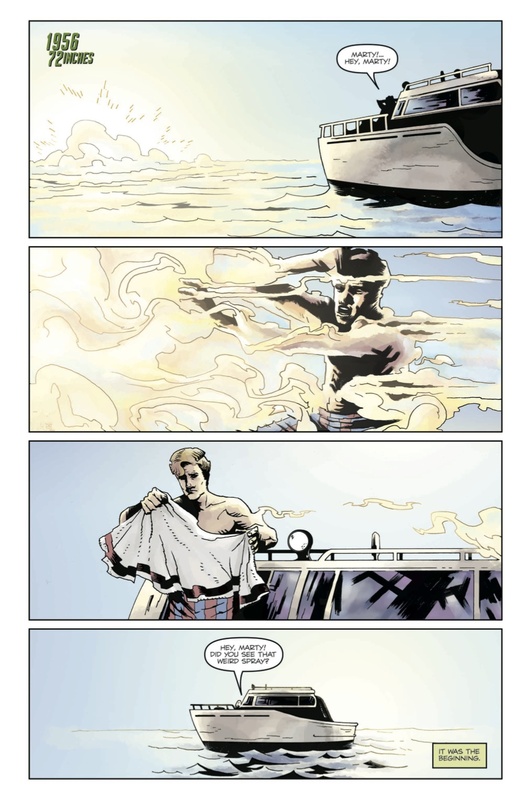 The comic is a great introduction for readers unfamiliar with the relatively obscure novel, and overall it’s faithful enough to satisfy Matheson fans. Be sure to let us know what you picked up this week in the comments below, on Twitter or on our Facebook Page!